I realised during my latest Game of Thrones rewatch that every now and then I’ll give my mouse a little shake to reveal the time tab at the bottom, while thinking to myself, please! I hope there are at least another 30 minutes to this episode. But Game of Thrones is the exception to the rule. For the most part, if I’m watching a movie/series and decide to check the time, like in the case of the new Hellboy reboot, it’s because I’m starting to get bored out of my mind. Funnily enough, this R-rated Hellboy is directed by Neil Marshall, who helmed some of my favourite Game of Thrones episodes. Speaking of the R-rating, I can’t remember the last time a movie tried oh so desperately to look and sound kewl. Neil Marshall’s Hellboy is that one classmate who comes to school wearing a middle finger T-shirt, a leather jacket and a nose ring. He tells the teacher he didn’t do his homework because “screw the system!” His phone’s ringtone is Smoke on the Water and when it rings, he purposely takes his time to pick it up, just so THE WHOLE CLASS KNOWS THAT IT’S DEEP PURPLE. He wants you to know he’s cool. But you know the moment he reaches home and closes his room door behind him, he’s jamming to Justin Bieber’s Baby Baby. Oh, and the nose ring is fake. It takes all about three seconds for the film to drop its first F-bomb but it feels forced. The classic rock soundtrack that accompanies the film doesn’t match the goings-on. The ultra-violence, particularly during the climax where giant monsters start ripping civilians to shreds feel jarring, cringy even, like a schoolboy screaming “hey hey! Look at me! I’m gritty! I’m cool! I’m so effing metal!” No dude, Deadpool is cool. You’re kewl. 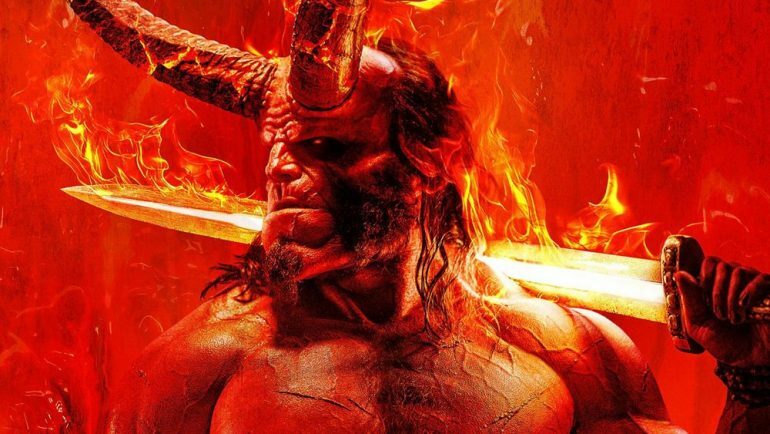 I’m not one of those rabid fans of the original Hellboy movies who prayed day and night to satan that Guillermo del Toro would get the chance to complete his trilogy. But at least with del Toro, you know there’s genuine effort put into the writing. And with del Toro, every frame is truly a painting that would make even Da Vinci jealous. The 2019 Hellboy has a plot that can be summed up in one sentence: A smoking hot antediluvian witch has returned to burn the whole world down and only Hellboy can stop her. But a lot of superhero movies are about a good guy trying to stop a bad guy who wants to dominate and/or destroy the world. The problem with Hellboy is that it’s merely a collection of scenes, half of which are exposition where mythical demon monsters and ancient secret societies spew one excruciatingly bland line after another about an impending apocalypse. The other half consists of weightless, meaningless and ordinarily choreographed action sequences where the red man-beast takes on tree-swinging giants and a talking boar. None of these action sequences (there are far too many) bear any stakes. And that’s because the film doesn’t have an emotional centre. The conflict doesn’t slowly escalate and build towards an affecting crescendo of a battle sequence. The screenplay takes Hellboy to a certain locale where he meets a character that points him towards a different locale. *Insert mundane dialogue that has a lot of big words but very little meaning* *Insert action* Move on to the next location. There is a way to tell good stories through pure action. We’ve seen it with Mad Max: Fury Road, we’ve seen it in The Raid, we’ve seen it in John Wick. In these movies, the action lengthy action blocks feel like dance pieces, with varying tempos and rhythmic flow. 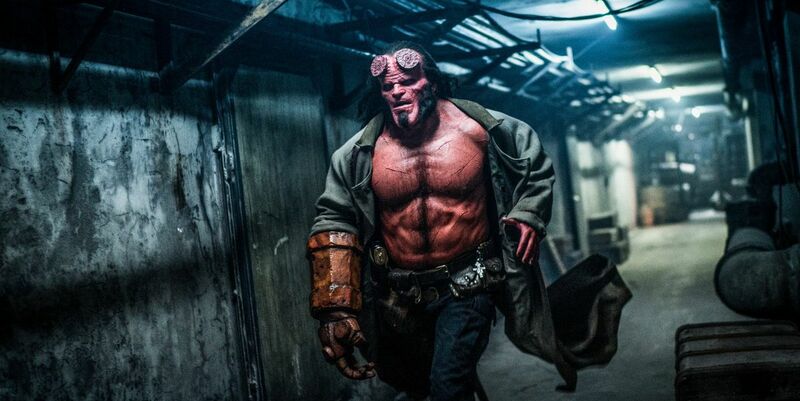 In Hellboy, the action is monotonous and doesn’t follow the beat of the amazing accompanying soundtrack. It doesn’t help that we’re not emotionally connected to any of the paper-thin characters. Their struggle means nothing, and neither does their death. Hellboy is the only character with some layers. He’s cool and badass but also insecure and constantly questioning his past. He has an Asian sidekick (Daniel Dae Kim) who can transform into a large cheetah and a Hispanic sidekick who can talk to the dead. The villain, Nimue (Mila Jovovich) likes killing and wants the world to end. I realise most of what I’ve listed aren’t actual personality traits, but that’s what’s presented in the movie. The film tries to create an interesting dimension between Hellboy and Nimue, as she tries to tempt Hellboy to join the dark side and fulfil his true destiny. But even this plot point is inorganically introduced and then glazed over quickly. It isn’t just Andrew Cosby’s writing that’s lacklustre, though, it’s also Neil Marshall’s vision. The film looks fine, with a good blend of CGI and practical effects, but not a single frame is as enrapturing as del Toro’s work of art. But that’s to be expected. There aren’t many who can match up to del Toro’s flair for the visuals. Beyond the aesthetics, the world building itself lacks a genuine sense of wonder with something interesting to discover at every corner. Harbour’s performance and natural charisma is the only thing that prevented me from dozing off. Well, that and his shared moments with the dad character, Professor Broom (Ian McShane). The smaller, talking moments between father and son is the film’s biggest redeeming quality. 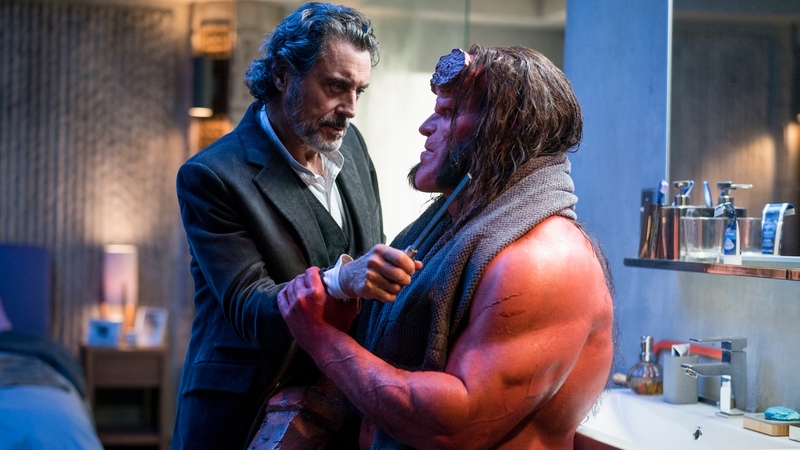 It is here and only here where some resonant emotional moments can be found, like their constant bickerings, or the poignant scene where Professor Broom helps Hellboy smoothen his horns.